The purpose of the mixed-media storage model is to account for changing quantities of solids and water in a storage facility over time. 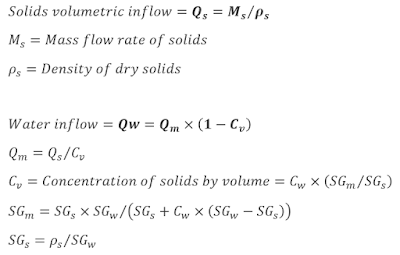 This model estimates the volumetric inflow of solids based on density and solid/water proportion of the material inflow. 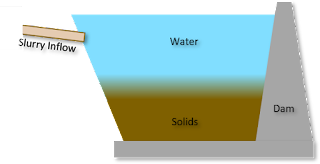 This inflow might be a slurry that has a high concentration of solids or just natural inflows with high sediment content. Either way, the basic concepts are the same. 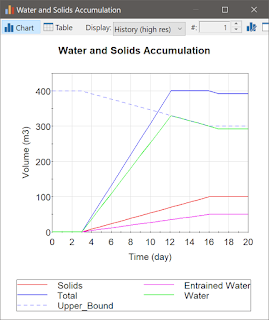 This model simulates the reduction in water capacity as the solids accumulate and account for entrained water in the solids so that it adequately accounts for the pooled water. Finally, this model accounts for storage and overflows using a geometric relationship of elevation-area-volume of the storage facility. Solids immediately settle in flat, even layers across the bottom of the pond. Solids are not being compacted over time. The model runs for elapsed time (not calendar) for 20 days with 1-day basic time steps. 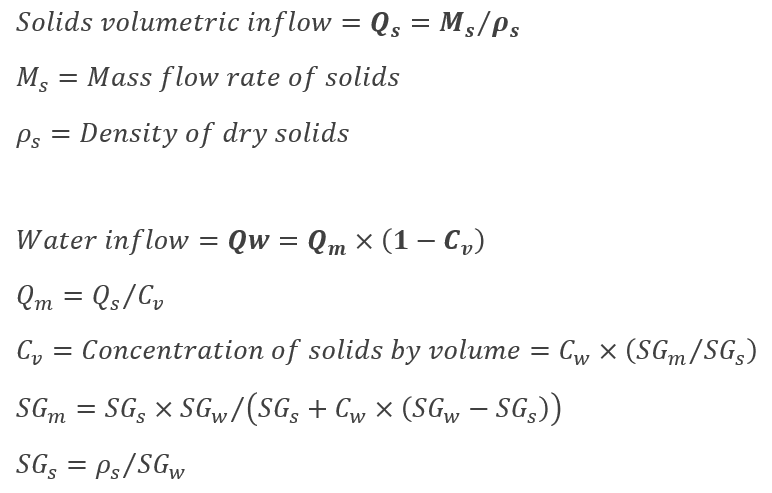 This model uses metric units of m3 for volume, kg (or metric tons) for mass, and m3/d for flows. The spillway elevation is 1.0 m. This is the elevation at which point water will begin to overflow. Note unscheduled events that occur at the bounds. Decide whether to allow unscheduled events or not. For this exercise, I will not allow them. You can do this as well by opening the Simulation Properties dialog, then click on "Advanced" Options. 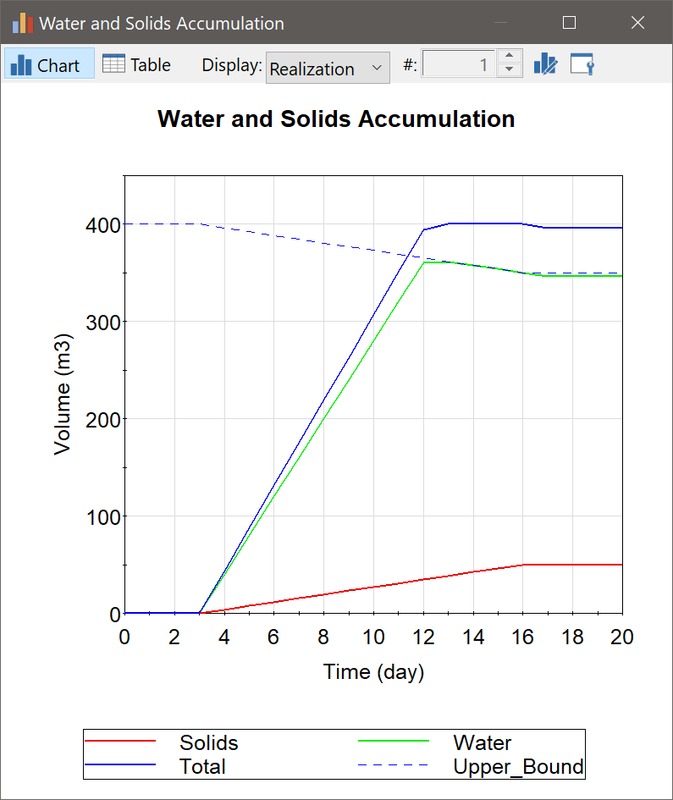 With the volumetric inflows of solids and water known, we can build the rest of the model. The model uses 2 Pool elements that keep track of the water separately from the solids on a volumetric basis. 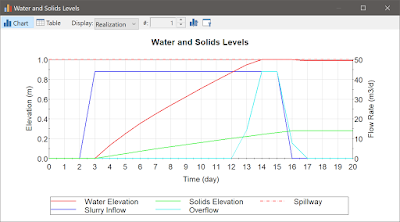 The total solid + water volume is also calculated so that the water level can be tracked through time using the elevation-area-volume relationship of the storage facility. 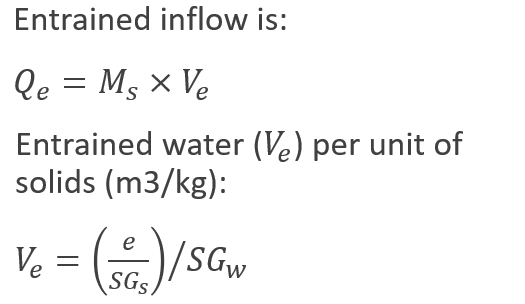 The upper bound of the water pool starts at an initial value then we subtract from this amount the solids volume that is accumulating in the other pool.This upper bound controls the overflow from the water pool. Note that GoldSim must predict the next upper bound value if it is changing. Sometimes, overshooting of overflow can occur when the upper bound suddenly stops changing as is made evident in the model when looking at the pool volume compared to the upper bound after day 15. 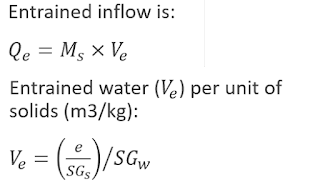 Note that the initial upper bound of 400 m3 controls the total volume but not the water volume. 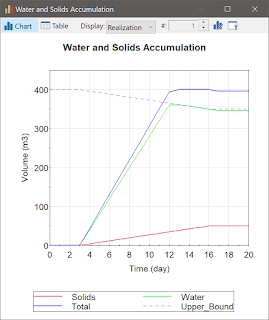 The water volume is controlled by the reduced upper bound, which is closer to 350 m3 near the end of the simulation. Entrained water can be an important component of the model if significant amounts of voids are keeping the water held up in the settled solids. This is because this water cannot be used and should be considered "lost" water. In this model, entrained water is lumped with the solids pool and is calculated as a function of an assumed void ratio (e) in the solids that settle out. Water must be removed from the water pool and added to the solids poll to include entrained water. 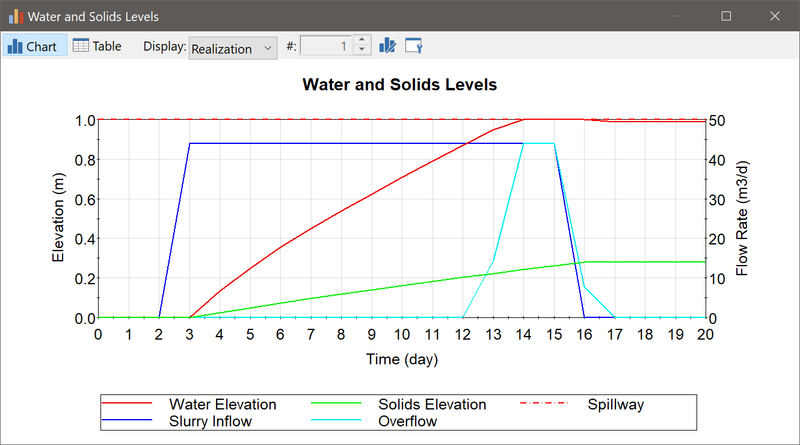 I use an elevation-area-volume table to estimate the water surface elevation as it changes through time. 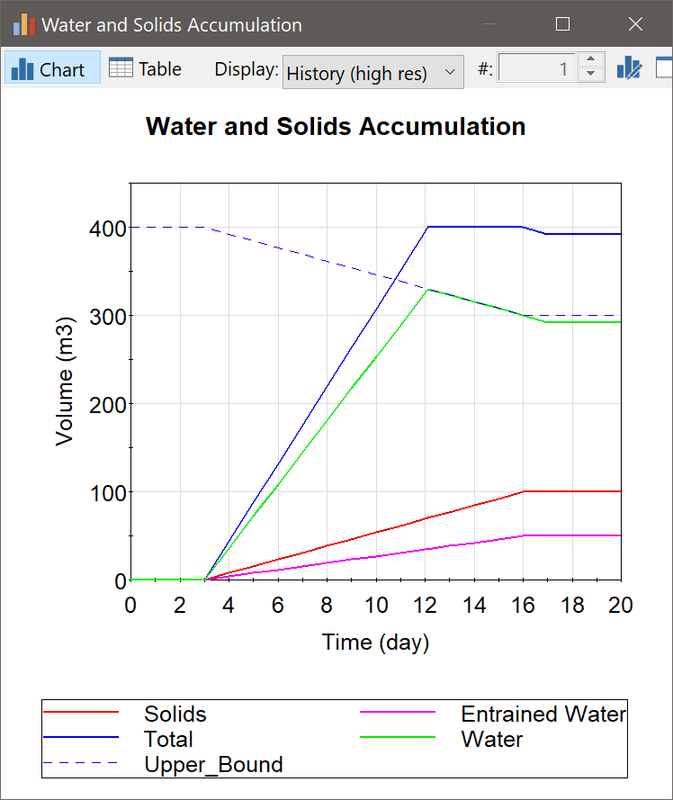 The important thing to remember when doing this is that you need to reference the total volume (solids + water) to calculate the water surface elevation since the solids are sitting below the water surface. If you are interested in playing with this model, you can download it from here. Please let me know know if you have any questions or comments. I hope you find this useful for your mine water modeling projects and/or water resources work.